After a tiring day at work, we can hardly wait to climb into our beds. A speedy nighttime beauty routine helps us hit the sheets in under 10 minutes, but we've recently run into a skincare issue that is slowing us down. Waking up the next morning with inexplicable breakouts is forcing us to give our satin pillowcases the side-eye. If we're being really good about washing our faces before bed, then these pillowcases must be to blame for our acne, right? Pillowcases can house dirt and oil. Like anything else that transfers dirt and oil to your skin, pillowcases can be the cause of acne mechanica, according to Dr. David E. Bank, director and founder of The Center for Dermatology, Cosmetic & Laser Surgery. "Acne mechanica is any type of acne that is the result of material or objects touching your face. When your pillowcase isn't laundered or changed regularly, a build-up of dirt and oil from the environment as well as your skin and hair touching the pillow is transferred back to your skin. This can clog pores and cause blemishes." It probably doesn't matter what material your pillowcase is made of, but rather what's lurking on it. Although some articles say that satin can cause breakouts, Dr. Bank believes this is not necessarily true. He explains, "No matter what material your pillowcase is, if it is not changed regularly, then it can have more grime, dirt and sweat. If you have any thick products on your hair when you sleep, the oils from your hair sit on the surface of your pillowcase and that can transfer to your face. However, this can happen if your pillowcase is cotton, silk or satin." Beyond the actual material that your pillowcase may be made from, Clark warns us that there are also harsh chemicals used during the manufacturing process in order to bleach or color pillowcases. This doesn't make for a heavenly slumber for those with sensitive or acne-prone skin. Not everyone's skin is equally impacted by their pillows. "Not everyone is going to break out from a pillowcase," says Ellen Clark, the founder and president of Control Corrective Skincare Systems. 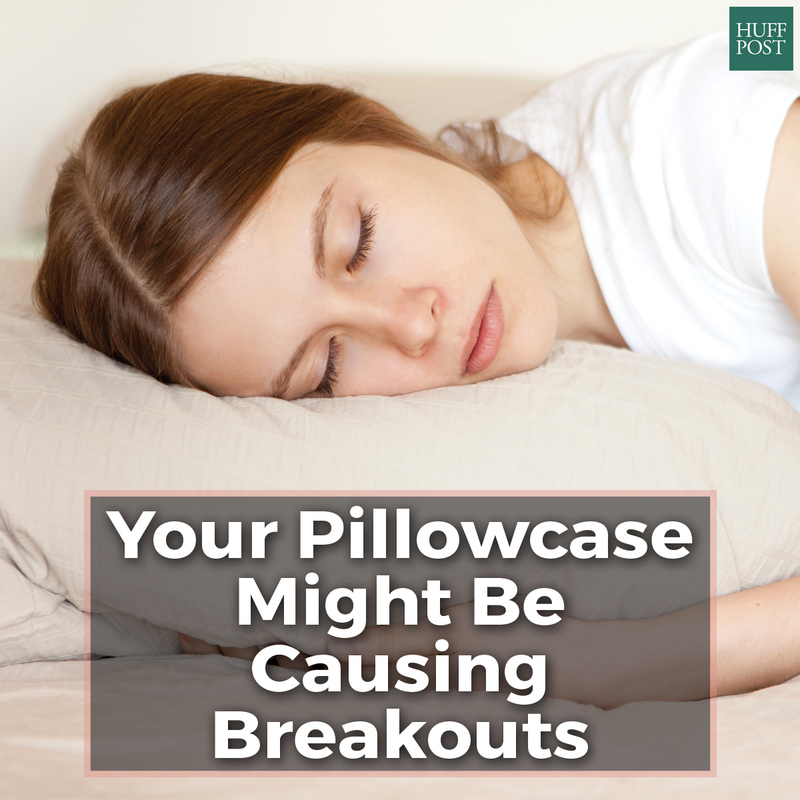 "But if you're prone to breakouts, whether it's because of hormones, genetics or stress, [pillowcases] can exacerbate an already delicate situation and cause micro-irritation." But you can take preventative steps. Wash your face every night. Seems obvious, but this will help to prevent dirt, grime or makeup from getting onto your bedding. Be sure to consult a dermatologist first for them to assess your skin and recommend the best cleansing treatment. Sleep on pillowcases made out of natural fabrics. These materials themselves breathe better and transfer less oil. Also, if you are using acne medications containing benzoyl peroxide or retinol, these products can deposit onto the pillowcase. So make sure your fabrics are white because the topical treatments will bleach them and interact with the fabric. Launder your pillowcases every two to three days. This ensures you're not lying on a pillowcase with several days' worth of oil soaked into it or pooled on the surface. Dr. Bank cautions that liquid fabric softener and dryer sheets leave behind a waxy residue that is highly pore clogging. Avoid using fabric softener on your pillowcases. Fragrance-free fabric softeners aren't any better -- in this case, it's the softening agents that are a problem for acne-prone skin.